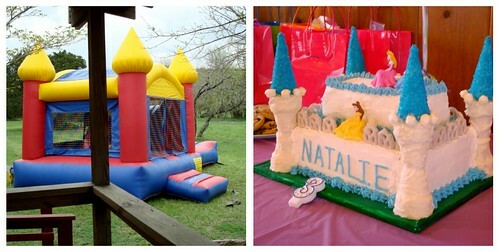 Of Bouncy Castles and Castle Cakes | bake me away! This past Sunday was originally going to turn me into a big ball of stress as I was to help with Rachel’s baby shower (1 – 3pm) and my niece’s 3rd birthday party (3 – 5pm). However, Rachel’s baby, Jackson, was born last Tuesday, about three weeks before he was due! Thanks again for all of the great freezable food suggestions, by the way. 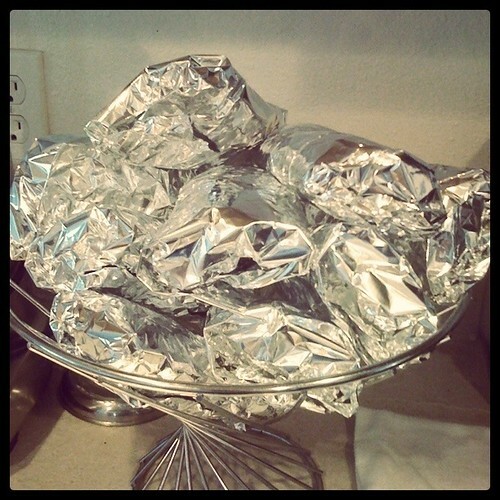 I ended up making batches of freezer burritos and scones, but then decided that cleaning their house would be an even more helpful thing to do since I had a key and all. Both mama and baby are fine, thankfully! 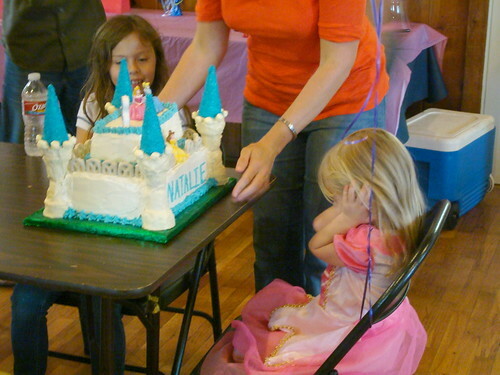 My sister was really relieved that I then had the whole weekend to help her with Natalie’s birthday! Each party so far has had a theme with elaborate (for us) cakes. With Natty’s love of princesses, this year’s theme was obvious. A castle cake was to be made! I have to say that this cake was 98% my sister. She made a homemade yellow layer cake and Swiss meringue buttercream all on her own! 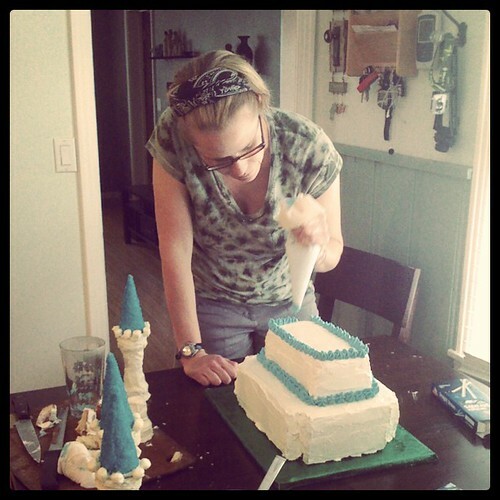 (Yes, I can pretty much guarantee that this was the best tasting castle cake ever.) All I did was level the cake layers and show her how to do things with a little frosting here and there. She was also just going by the looks of a couple cakes she found online. She did a great job, don’t you think? The yogurt pretzel lattice was a pretty brilliant, super easy trick. We ended up hiding the cake on the kitchen counter behind bags, but the sweet smell gave it away to Natty in the morning. 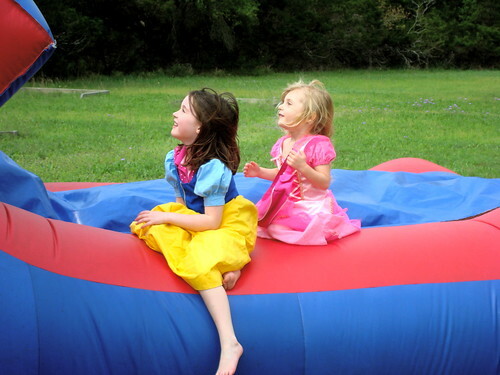 To counteract the sugar rushes, my sister rented a bouncy castle for the kids! They loved it of course, especially while decked out in princess dresses. 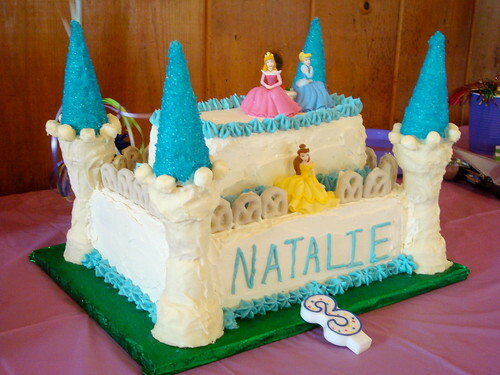 Though it’s not officially until March 30, Happy Birthday, Natalie!! Update: My sister posted about it here! Maybe your sister should be a party planner in her free time! Okay, I’m kidding, but that cake and party looked great! When kids get into the phony shy fad I kind of just want to grab them by the shoulders and shake them out of it. Good thing I’m nobody’s mother, but, cmon kids, yer just playin’! Glad to hear Mamma and bay are doing fine! This cake is adorable, what a grat job. The picture of your niece covering her ears is too cute. samology – She’s a creative sister! 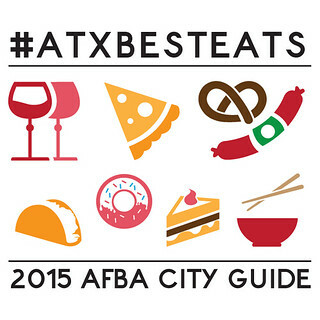 thelairweddings – Thanks, it was so good, too! Paula – I’m glad they are, too! And yep, she’s a cutie. I wouldn’t shake you, promise. d’aww. 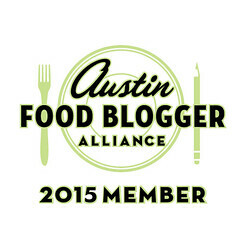 What a good blog pal! I have to say that you have great skills to do cake frosting. You must have done it in a long time. There should be lots of fun time.